Comex, the developer behind Spirit and JailbreakMe jailbreak tools has confirmed the arrival of userland untethered jailbreak for iOS 4.2.1 to be released on Christmas. MuscleNerd of the iPhone Dev Team has just confirmed the same thing. 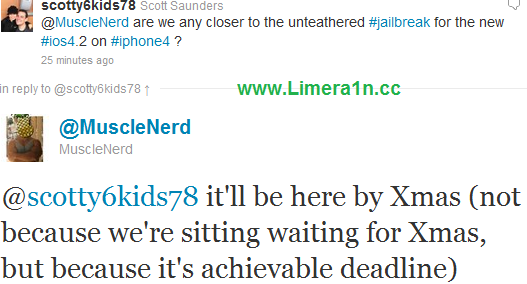 In a deleted tweet spotted by RedmondPie claims that a untethered jailbreak solution for iOS 4.2.1 is indeed in works, and that it will be ready for prime-time use somewhere around Christmas. We still don't know how reality is this tweet but it seems real. but why MuscleNerd deleted it? We'll keep you updated as more comes !